Women are under represented in the architecture, engineering and construction industry. Only 20% of registered architects in Canada are women, are 23% of engineering graduates and only 14% of skilled trades. The barriers to participation for women in non-traditional occupations are complex and the journey to a fulfilling career an be complex. 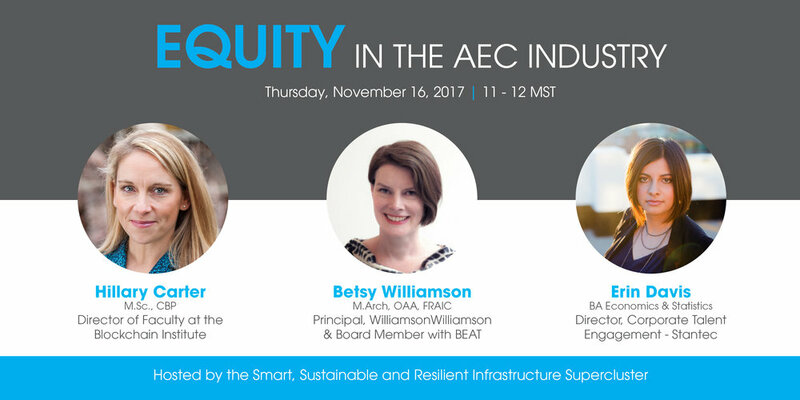 for an online discussion of best practices for the attraction, retention and advancement of women to move the architecture, engineering, and construction industries to gender equality. Who is the Smart, Sustainable, Resilient Infrastructure (SSRI) Innovation Supercluster? Positioning of the AEC industry in key global markets. Partners include: Stantec, PCL Construction, Ledcor, All Weather Windows, Manasc Isaac Architects, NAIT, SAIT, University of Calgary, University of Alberta, Athabasca University, Integral, Barry Johns Architecture, Connect Thermal Energy Solutions, Archineers Consulting, Terravent Systems, Fox Architecture, Earth Tube Systems, Dante Consulting, Matchbox Energy, Vanderstar Engineering, Prima, Canada Green Building Council, Alberta Innovates and Go Productivity.